Paper Crafts by Candace: Jaded Blossom Monthly Challenge: Crafters Choice! Happy Sunday!! It's the first sunday of the month so that means is Jaded Blossom challenge day! I went on vacation to San Diego last week to a convention called Comic Con. I thought it would be fun to make tip envelopes with a nerdy comic theme for the hotel room maids and waiters / waitresses. I got these icons awhile ago so they are no longer available. These tip envelopes are from SVG Cutting Files. I used Mini Tag Dies 2, Kind Thanks and For the Hostess Jaded Blossom stamps. Thanks for checking out my project today! Head over to Jaded Blossom to see what the rest of the design team created! So perfect for the occasion.. love this idea. I love the Comic Con!!!! When I lived there I went every time then when I got older I got a job for the security company that worked there. Then I ended up working at a booth that sold swords/daggers/axes. I miss living in San Diego. So awesome you did this. These are so awesome! 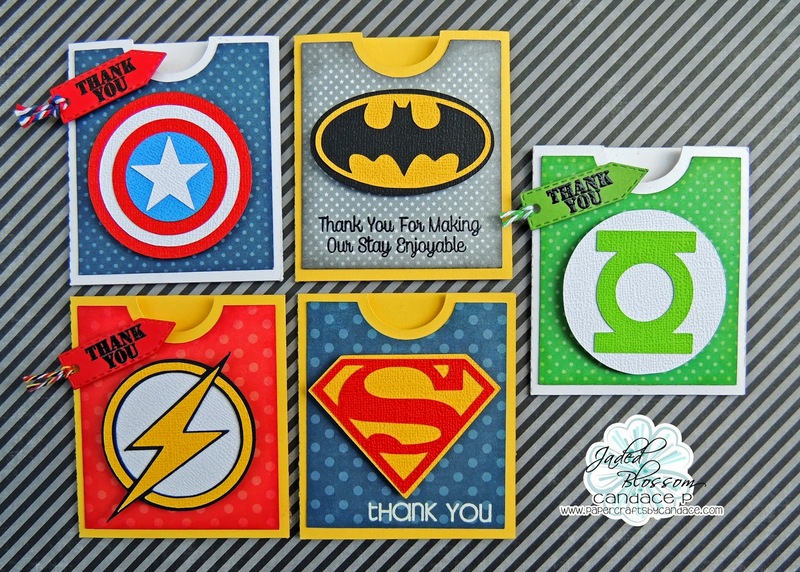 Love the superhero theme! very cute! I bet they loved to receive them! Way Awesome. They must've loved these.